Like many things in life, grocery shopping has become an increasingly complicated and stressful business. While many of us want to make a difference through our food choices, we often don’t know where to start: Which companies and brands can we trust? Is buying organic worth our money? Are GMOs dangerous? In order to help you make better food choices and move through your supermarket with ease, I’ve compiled a simple guide on how to read ambiguous food labels like a true expert. This is the most controversial, and therefore the trickiest, too. We all know people who swear by organic food, yet there are studies that also show that organic isn’t much better than its its conventional counterparts. Rather than trying to convince you that one is better than the other, I’ll let you decide for yourself and only tell you what organic is and what it is not. Its ingredients are grown on soil with no fertilizers and pesticides applied for 3 years prior to harvest and contain no genetically engineered substances. Animals are fed organic feed and not administered antibiotics or hormones. Processed foods have no artificial preservatives, colors or flavors,with minor exceptions. Animals were raised and slaughtered in a humane way. Crops were not grown in monoculture or transported long distances. It is more nutritious or better for the environment. All foods that have been certified as ‘organic’ according to these definitions will bear the USDA Organic Seal. Note that there is no difference between a black, brown, white or green seal – they all mean the same thing. It’s completely up to the company to choose a color that fits with its company aesthetic and has nothing to do with the grade of organic. 100 Percent Organic – ingredients contain no chemicals, additives, synthetics, pesticides or genetically engineered substances. USDA Organic – products must contain at least 95% organic ingredients. The other 5% non-organic ingredients can only include additives or synthetics that are on the USDA-approved list. Made with Organic – products must contain at least 70% organic ingredients. This is relatively more straightforward in that if you see the label “Non GMO Project Verified” on your food, it means that no GMOs were used in all aspects of farming and processing. However, an important distinction is that while all organic food is GMO-free, not all GMO-free products are necessarily organic. Additionally, while ‘organic’ food is regulated by federal law, this label is not – rather, it is issued by a non-profit organization that independently offers GMO test verification and labeling. To best avoid GMOs, look for both the USDA organic and Non-GMO Project seals. Unlike the previous two labels, this one doesn’t hold much promise at all. While it claims to meet the Humane Farm Animal Care Program standards, the requirements itself are vague and meaningless without a measure. For instance, while the standards stipulate that animals are fed a nutritious diet without antibiotics, raised with shelter, resting areas, sufficient space and the ability to engage in natural behaviors, it doesn’t ban metal crates for sows and fails to require that animals have access to the outdoors (no doubt part of an animal’s ‘natural behavior’). Moreover, the fact that it is paid for on a per animal basis suggests the program has built-in incentive to house animals in large industrial facilities or CAFOs. This is the one you should look for instead of ‘Certified Humane.’ Developed by the Animal Welfare Institute, which believes that industrialized agriculture is “inherently hostile to animals and that only non-industrialized farming can be truly humane,” AWA certification requires that animals be raised on real family farms and prohibits industrial practices like sow crates and liquefied manure systems. Although both labels are regulated by the USDA, they are both purposefully vague and don’t guarantee that animals were raised in a humane way. ‘Cage-free’ only means that hens don’t live in conventional battery cages – the term does not indicate how much space they get or whether or not they have access to the outdoors. Though cage-free hens do have a little more space than their conventional friends, many are often still raised in crowded factory-farm facilities. As for ‘free-range,’ the USDA has done little to define it, requiring only that hens have access to the outdoors. The term does not specify how often it gets to go outside, how large the space is, or whether it’s pasture or concrete. According to Michael Pollan in AnOmnivore’s Dilemma, the doors to the 15ft wide yard are shut until the chickens at least 2 weeks old. During this time, many get accustomed to living indoors and are afraid to venture out there. Additionally, since they are slaughtered at 7 weeks old, most hardly go outside at all. 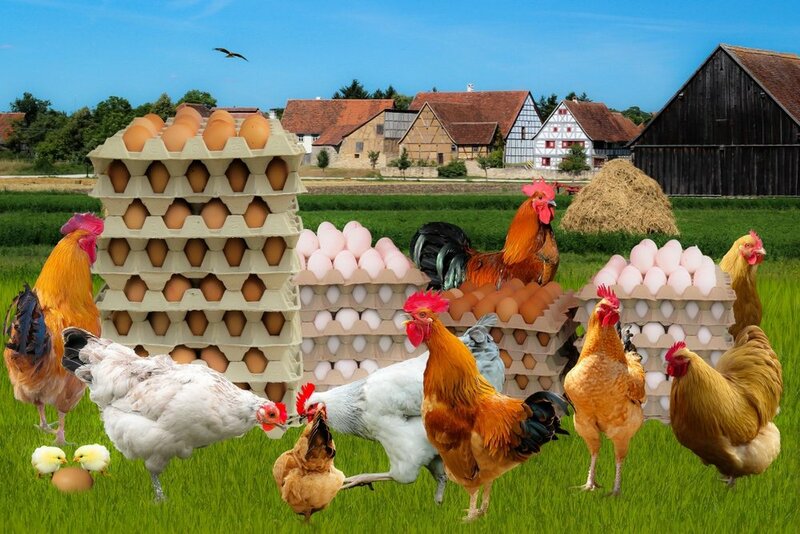 So, the question of ‘cage-free’ or ‘free-range’ eggs is actually neither. Instead, look for the ‘pasture-raised’ label, which stipulates that the hens were given 108 square feet of grassy pastureland to roam around in (though not regulated by the USDA).